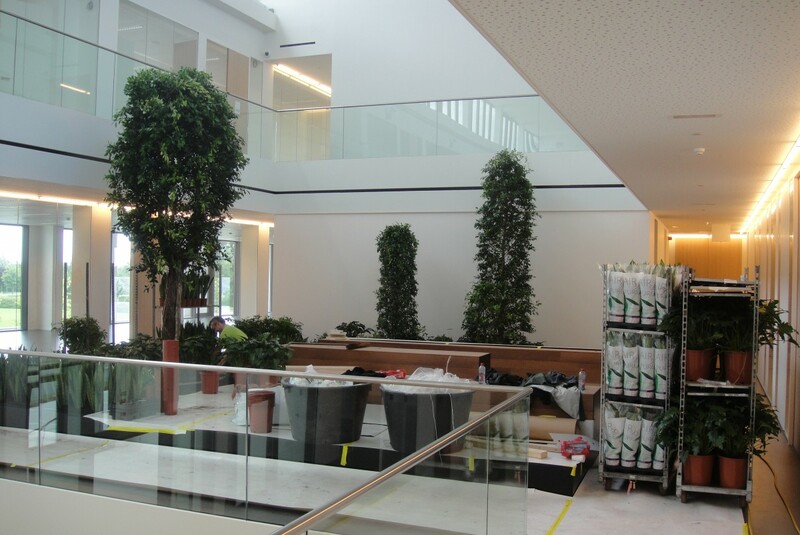 The new office building has an open entrance hall with at both sides on level 1 a symmetric interior garden. 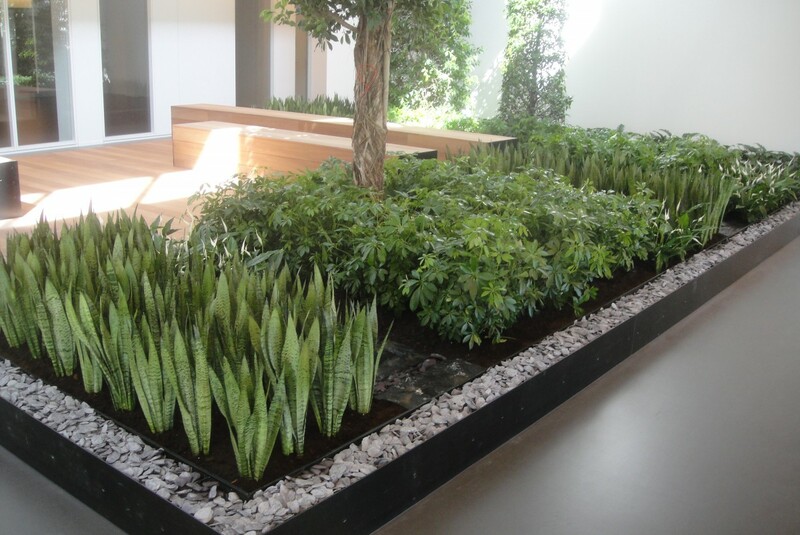 Both interior gardens are combined with a seating/coffee area for visitors and employees. Owner and architect wanted greenery with a strong architectural look. The floor load was limited to 300 kg/m² , the gardens located at the first floor had limited access possibilities and light conditions were not optimal . The seating area was designed by the architects so we thought that the continuation of that idea into the garden could be nice. The pathways pavement (with a rough rock finish) is following the design of the benches,so that there is a connection between the seating area and the gardens. Those pathways made of Granit Bluestone make it easier to access the garden for maintenance. 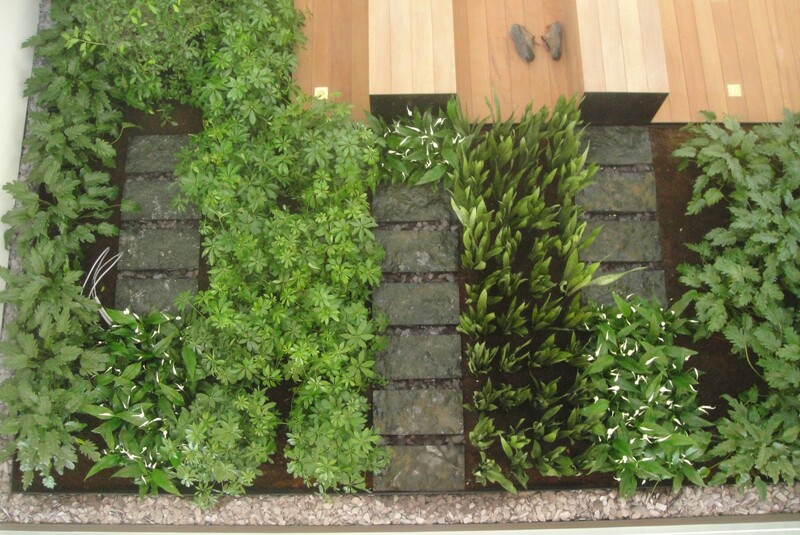 To stay in the minimalistic idea we decided to limit the plantspecies to 4 varieties in a well orchestred design. Vertical design plants (Sansevieria), bushy plants (schefflera ) and pryramidal Ficus trees give the structure. To make it architecturally strong we bordered the plant and wall side with a gravel path of Schiste stone . We think we worked out a nice combination of wood, gravel, pavement and greenery in a modern and timeless design.